Finally, here comes the fun stuff. Now that you have imported some files we are ready to create a composition, which acts as a container for us to place our files in and begin to make a movie. From your menu go to Composition > New CompositionYou will then come to the composition settings pop-up window. From here you can change the size, resolution, aspect ratio, frame rate, duration and some advanced options for motion blur and so on. Motion Blur Note: Make sure your shutter angle is 180 or 360 degrees for best results. There are quite a few ways to add footage to your composition. However, the best and most efficient way is to simply drag your footage down into your layer panel—this gives you the best control because you can place certain footage files above or below to have your footage sit in the desired order of your project. Once you footage is in the comp, the title of your footage will appear. You can change the title by selecting the layer and pressing the return key. Once your footage is live and resting in the layers panel, you can begin to use effects and adjust the basic position, scale and opacity to animate your layer footage. 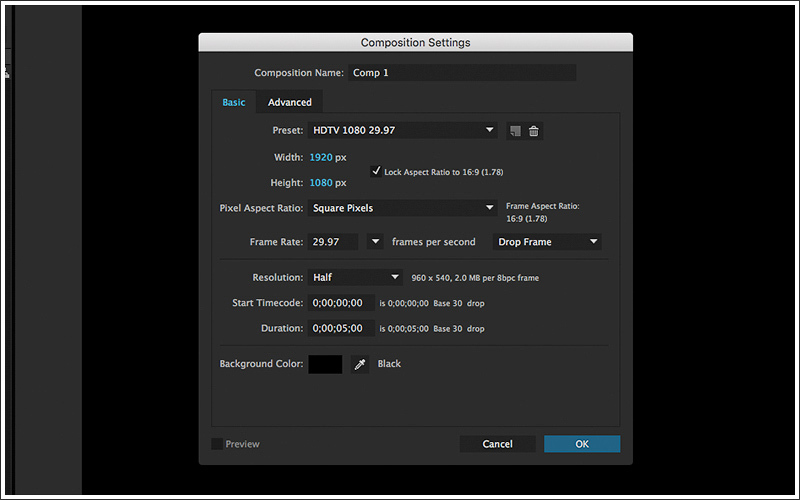 A very useful feature in AE is a pre-composition. This feature takes selected layers of your composition and combines the animated keyframes and any effects you have added to a new composition, leaving behind the flattened version of the clip you created. You can then go into that composition and make edits and adjustments that will automatically update in your original. To perform a pre-comp function select single or multiple layers from you composition, go to Layers > Pre-Comp or you can use Ctrl+Shift+C to bring up the pre-comp settings. There are three main options for a pre-composition function. Leave all attributes: This feature creates a new composition containing only the source file and leaves all effects, masks and other adjustments applied to the Pre-comp layer. 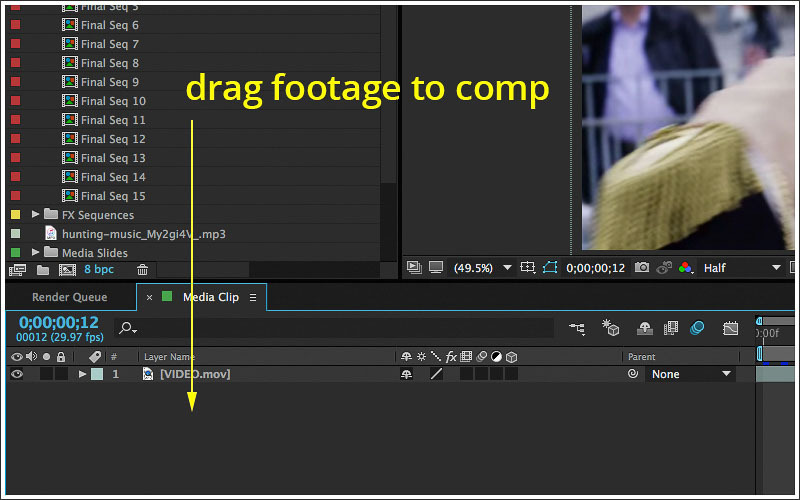 Move all attributes to new composition: This feature creates a new composition while duplicating the master composition and moving all applied effects, masks and other adjustments to the new composition. 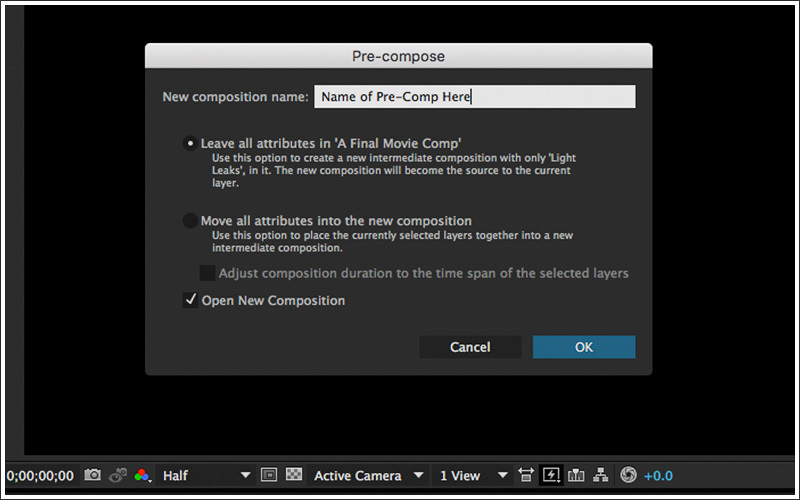 Open new composition: This checkbox will tell AE to open the recently created pre-comp. The pre-comp will show up in your project window. Next up, saving and exporting your project!